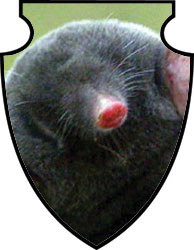 The mole is a small, insect-eating mammal. Contrary to a commonly held belief, it is not part of the rodent family. Moles live almost entirely underground in a vast network of interconnecting tunnels. They frequently create shallow tunnels just below the surface where they capture worms, insects, and other invertebrates. Moles will eat roots, bulbs, and other plant material, but generally the greatest problem caused by moles is their burrowing, which dislodges plants drying out their roots. Moles are active throughout the year, although surface activity slows or is absent during periods of extreme cold, heat, or drought. Moles can cause significant problems in landscape or garden areas, especially in turf. Depending on the location, time of the year, and distance from the near structures, AmeriGuard has different treatment options in order to control your mole issues. A technician will perform an inspection during the initial service and will advise if traditional pesticides should be used or if the yard is an appropriate candidate for the Rodenator service described below. Rodenator: Blast Burrowing Moles Sky High! We are proud to announce the newest addition to our mole extermination arsenal: the Rodenator. This tool fills the mole’s tunnel systems with a mixture of combustible gas and ignites them, creating a shockwave which kills gophers, squirrels, moles and other burrowing rodents. Proven to be 92% effective on the first treatment, the Rodenator is a non-chemical solution for large lots, ranch houses, farms and agricultural areas.